Some 65 families lost everything in a fire in a Marlboro squatter camp on the edge of Alexandra township on Wednesday 28th February. (nearest corner 1st and 3rd, close to Pretoria Main Road). The cause of the fire was not known and as it occurred in the middle of the day when most people were alert and awake, there were no major injuries. 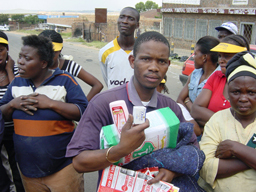 On March 1st 2007 Children of Fire delivered disaster recovery packs including such items as second hand clothes, blankets, soap powder, toothbrushes, toothpaste, safety candle holders with candles, Danish butter cookies, basic foodstuffs including at least one 5kg bag of Iwisa mielie meal for each family, soup, pilchards, tea, Dove soap, Dawn moisturising lotion, hats, writing materials, magazines and lots of toys. Some heads of household included: Victor Maake, Habas Mallane, Grace Sebela, Dynah Matjila, Germinah Rapetso, Dorcus Molopo, Evah Maake, Zarazara Ndlovu, Erick Sebela, Huring Ephraim, Bessie Mayokotela, Maphela Mothopi, Noita Baloyi, Reedban Mokari, Nkhesani Masisinyani, Amos Xivambu, Lucas Hlungwani, Isaac Langa, Settlers Chauke, Edward Hlongwane, Edward Mbezi, Khesani Shivabu, Daniel Ringani, Mike Sebona, Albert Gobola, White Maluleke, Edwin Sathekge. The second trip assisted families headed by: Solly Rakwale, Thomas Ndlovu, Hangalakani Letswalo, Precious Mangane, David Baloyi, Maczimel Baloyi, Tue-king Langa, Happy Mkansi, Falizwe Mnginisi, Golden Letswala, Trix Malame, Ephraim Makhubela, Pamuel Chauke, Kenneth Chauke, Magic Chauke, Solly Shitzinga, Bally Letswalo, Marika Moseisi, Emily Lekoata, Joseph Langa, Thomas Baloyi, Louis Shivambu, Bassa Machukucla, Traccia Mosesi, Emanuel Mabasa, Samson Baloyi, Sam Nghonyama, Betty Ramashala, Eric Chuma, Richard Khosa, Lucky Maluleke and Daniel Hlongwane. Many babies on backs and young children were affected - but the toys took their minds of their troubles for a while. Thanks to UMashesha volunteers Felix Neumann, James Phosa, Tomoko Harada and Michelle Daniels. Thanks to Edward Upton for the loan of his bakkie. And thanks to many individual donors as well as Dis Chem, listeners to Jacaranda FM and Premier Foods. The largely Shangaan, Venda and Pedi community were supplied with building poles by Disaster Management and spent Thursday hammering out the buckled corrugated iron, rebuilding their homes. Rebuilding their lives will take longer, especially trying to replace vital documentation like school matriculation certificates, now just ashes underfoot. For further information email firechildren@icon.co.za or phone 011 726 6529. Children of Fire would like donations of non-perishable foods, saucepans, Parasafe stoves and tin openers, to assist these fire survivors and others in future. 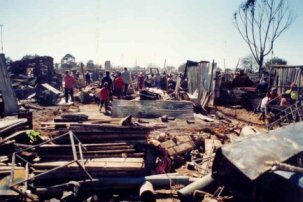 In 2003 Children of Fire went to the aid of thousands of families in Greater Johannesburg who lost their homes due to fire. While the plight of those left destitute made the headlines for a few days, the problems went on for months. Our volunteers stepped in with clothes, food, pots, bed linen and hands on help, especially to the injured and to the bereaved. The biggest fires were in July, August, December 2003 and January 2004 but the biggest risk periods remain the coldest nights. 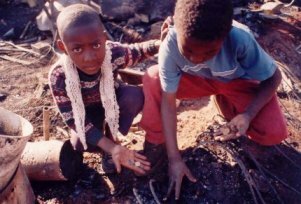 Just in the first week of May 2004 there were two small fires, one in Zevenfontein squatter camp and one in Alexandra, that didn't get mentioned in the media - but again Children of Fire was there to help. One of our firefighting water tanks was used to extinguish the Setswetla, Alex, fire after it had razed four shacks - and saved a considerable part of Alexandra which had been entirely without water for 24 hours. Then in early June, 31 families lost everything in Alexandra in one fire. We helped them all and we assisted with other small fires in the township too. 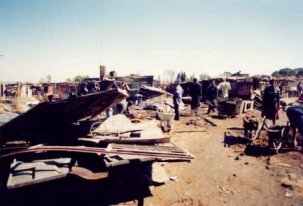 Again in mid July 2004 some 40 families lost all their possessions at George Goch settlement in Denver, Greater Johannesburg. Our volunteers were on the scene with clothing for all the families affected. Three times in August 2004 so far there have been further fires in Alexandra. One affected about 27 families (at least 100 people) in 8th Avenue near Vasco da Gama on August 13th, after a man left a stove on when he allegedly went to the shebeen. It is also suggested that due to the slow rate of electrification of the township, that those shacks were using illegal electricity that was highly likely to cause a fire. The residents of 8th Avenue were the fortunate recipients of Children of Fire's first Disaster Recovery Bags. These tough red cotton bags were made by a women's co-operative, and the cost borne by staff from the British High Commission in Pretoria. The tins of corned beef and the saucepans were funded by the Cradle Project - an employee volunteer project within Investec; the sugar cane gel stoves were funded by Pick n Pay; Varsa Trusts money went towards safety candle holders and First Aid supplies; AMB Advisory Services contributed towards the wash things; individual donors including Trevor Murugasen; Roshan & Judy Parbhoo, Kuben Rayan; Andy Naidoo helped with crockery, cutlery and non perishable food. When all hope is lost, it lifts people's spirits a lot to be able to cook their own food, light their temporary shelter, wash their faces and clothes, and to be able to give their children books and pens to take to school the next day. The bags also included a couple of outfits of second hand clothes and at least one pair of shoes. Where young babies are noticed - or even heavily pregnant mothers, more effort is made to give those families extra support. Another fire hit at least 46 families between 12th and 13th Avenues on Wednesday August 18th, 2004, just when the children had arrived home from school. Again we have helped the people with clothes and household supplies. 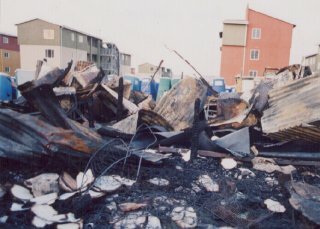 Then on August 24th 2004 there was a fire on 16th Avenue. At least 200 people are affected. We took bread, vegetables and clothes to them. On Saturday 4th September there was another fire in a small house in 17th Avenue, Alexandra, affecting seven families. It is believed that someone left the stove on by mistake. Our volunteers were on the scene before the fire brigade and commented, again, that Alexandra Fire Brigade's firefighters are not sufficiently equipped to help and that they have to wait for Sandton Fire Brigade to arrive - typically 20 minutes later. A huge amount of damage is done in 20 minutes. One man lost his life and the other people lost all their possessions. On Friday 10th September there was a fire in Third Street, Marlboro, just on the edge of Alexandra. Our UMashesha volunteers were on the scene within ten minutes of it starting and called the emergency services - who only reached the scene around midnight. At least one infant died in the squatter camp sited within a disused factory. Male residents were slow to react as many were drinking in a shebeen nearby. Clothes are needed for about 200 people. Children of Fire is also assisting the 11 households whose homes were illegally demolished by Metro Police on September 8th in Crosby. Their building materials were stolen. One child aged five, who lost her home has been taken in by the charity. A charity representative was assaulted by a council employee on the scene, as she tried to photograph the devastation. We anticipate more fires are just around the corner. In the other instance, we hope the behaviour of Metro Police will not be repeated. 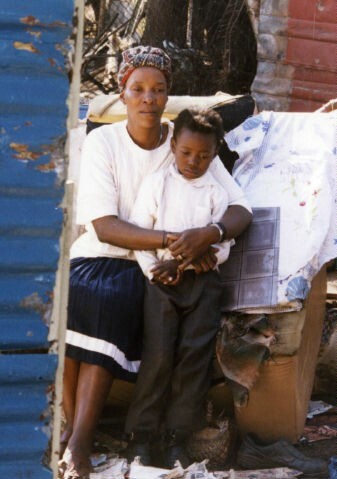 Nondiya Mtolo (45) and her daughter Tryphina (5) after Metrol Police illegally destroyed their home on September 8th 2004. Children of Fire took Tryphina in, until she had shelter again. Please plan now for the inevitable tragedy of squatter camp life in South Africa. Ask your staff, friends, relatives, colleagues, to collect packages of clean clothes including underwear, so that we can ensure that everyone affected by fire has at least one change of clothes when they have nothing else left at all. From the youngest to the oldest, thin and fat, we help everyone that we can. The easiest way to do this would be e.g. to put trousers, socks, underpants, Tshirt, jersey, in a bag and label it "thin short man" or "tall large woman" or "toddler girl" or "teenage boy" as appropriate. It saves a lot of time on sorting. Non perishable food, saucepans, tin openers, wash things, buckets, school uniforms, exercise books, text books, reading books and other school stationery and toys are also welcome. School shoes are always needed. Financial donations would be used for sugar cane gel stoves (R50) and safety candle holders (R20) or to purchase bread and other staples. We also recommend a "hot bag" (R65) as a safer way to prepare food in any community as it more than halves the cooking time (saving fuel), and by putting a covered saucepan inside the foil and cloth bag, there is less risk of fire and injury from open flame stoves. The bags have been demonstrated to our volunteers and as with burnshields, stoves and candelholders, it would be best to factor in R200 per fire for someone to demonstrate the cooking of a simple meal with the bag as well as showing exactly how to use the other safety devices. Sometimes slightly out of date food is available in an emergency through the Robin Good organisation, but then we need help with transport to collect it from the Randburg area. We hope that hotels and food shops will become more proactive with their assistance. 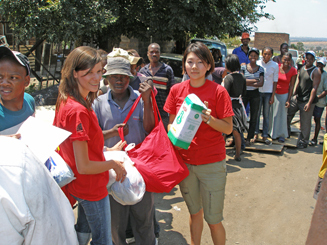 Beyond Gauteng we do not assist with bulk supplies of food and clothes, due to the lack of trained volunteers. Sometimes volunteers are also given clothes etc in recognition of their assistance. However we do carry out fire prevention and first aid training and outreach across the country and assist badly burned children throughout the land. Katlego Malatji, age 13, died on Christmas Day. He was the third victim of the fire at Joe Slovo squatter camp that started around 3am on December 22nd. He survived 72 hours after initial injury. Children of Fire calls on the National Department of Health and the Gauteng Province to review the policy regarding child burn victims. There are not enough ambulances. (The media should have access to the Emergency Services SMS system that regularly reports there are no ambulances or fire engines for vast geographical areas, or that key staff such as drivers, are unavailable. In that way there could be updates on radio and people would know that a possible solution lay only in their own hands). There are not enough ambulance staff. There should be a full-body-size burn shield on every ambulance and on every fire engine. A burn shield is a South African invention. It is a cooling antiseptic dressing, available from hand size to blanket size. It is most important to cool a burn straight away, in as sterile conditions as possible. It is expensive but not in relation to all the other costs involved. All badly-burned children should be taken immediately to Chris Hani Baragwaneth Hospital OR the other main hospitals e.g. Johannesburg General, Helen Joseph, Edenvale, Coronation, Leratong, should be equipped with proper burns treatment facilities. (Leratong has a burns unit but it is not sufficiently well equipped).The age limit whereby Baragwanath (Soweto) and the Red Cross Hospital (in Cape Town) among others, state that at 13 years old a child is now an adult, should end. On the statute books, one remains a minor until the age of 18 or 21, depending upon which law is being applied. Internationally it is generally accepted that one remains a child until one's 18th birthday. Even South Africa's Department of Education will (theoretically) allow you schooling until the age of 15 before it deems it is too late to try. (policy document relating to age and grade of pupils starting school). The percentage of the body burned should not ever be a reason for turning a child away - or even for refusing admission to an adult - from the best possible medical facility that they can reasonably be taken to. It is not for any hospital administrator to play God and take the decision to turn a child away; to send them to a certain death. Public-private partnerships should be put in place so that in Greater Johannesburg ambulance crew can divert to Milpark Hospital, Parklane Clinic, Brenthurst Clinic, Sunninghill Hospital, etc if they have appropriate facilities. It costs approximately R1000 a night to stay in a private hospital and about R700 a night to stay in a state hospital. But that is a fraction of the overall cost involved of nurses, doctors, surgeons, theatre time, theatre consumables. Most medication in a private hospital costs three times as much as that in a state hospital. The state should reimburse the private hospitals speedily for medicines and medical consumables used and it should sort out the disparity in costing. The ambulance transporting Katlego was told to take him to Helen Joseph Hospital. The reasoning was based on his age 13 ("an adult") and that an adult with more than 60 per cent burns is refused admission to Baragwanath.Helen Joseph Hospital has no burns unit.He was taken to the Intensive Care Unit. That unit has one toilet for staff and none for patients. It has no bath., just washhand basins. It is not even easy to create a sterile truly-isolated environment. When the child arrived, he was in incredible pain. He was sedated with morphine and domicum. He was intubated so he was not able to talk. He was assisted to sleep all the time, because the pain of burns is so unbearable. The next day he "arrested" but he was brought back to life. His body was covered in Flamazine and Children of Fire offered to pay for any dressings that the charity is aware various state hospitals are not allowed to provide, on grounds of cost. There was no special bath for debridement, to remove dead tissue and other material that would prevent healing. It was planned to take him to theatre to carry out the procedure but he was too unstable. The staff at Helen Joseph did everything they possibly could do, under impossible circumstances. Many decisions are taken by administrators with no knowledge of the repercussions. The most common reason for death after burns is infection. The skin damage for lesser burns can be minimised by using see-through dressings that allow the wound to heal underneath without disturbing the delicate skin structure as it heals. Where medical staff are forced to use gauze that tears away the new skin each time it is removed, they are increasing the risk of infection and it is a totally false economy. Even using paraffin-impregnated gauze only works in certain situations as it dries out very quickly in the South African climate. Some paramedics and nurses are not yet aware of technical innovations that improve healing or that one now tries to keep wounds moist. But the biggest problems are with accountants who do not understand that using a R100 dressing versus a R5 dressing may save R10000 in theatre costs - and may also save a life. For burns survivors, there is often unnecessary disfigurement, unnecessary pain and avoidable further surgery because of lack of explanation to the families about what has to be done in the long term and because of the shortage of occupational therapists who can prevent useful limbs and digits from contracting into useless claws and limbs bent rigid at 90 degrees. The decision by surgeons to use a mesh-like skin graft is taken to use a little skin to fix a large area. It should be avoided on areas of the body like hands and forearms that are going to be visible for the rest of the burn survivor's life and make the skin look like that of a crocodile or a fish. The surgeon would not take such a disfiguring decision for his or her own child. Katlego Malatji was the nephew of Joshua Malatji, owner of the Spaza shop where the fire began. In the centre of the inferno, a couple lay sleeping. Wally Maduna, in his early 50s and Sinah van Schalkwyk aged 52. They had tried to escape the blaze, as their bodies were not found on the remains of the bed, but it seems that they were overcome by the smoke. Two days after the fire, Children of Fire called Superintendent Mbanyele at Brixton SAPS to remove Sinah's shoulder, which the mortuary van had left behind. It was causing great distress the people trying to rebuild their homes adjacent to the "grave". Donations to help the people after the fire would most usefully include: Large sacks of mielie meal, small saucepans, paraffin stoves, candles and safety candle holders, non perishable food, tin openers, buckets, bedding, clothes for fat, thin, old, young. Washthings including plastic buckets and bowls, handwashing powder, soap, toothpaste, toothbrushes, facecloths, towels. School uniforms, text books, shoes, straight timber poles for the corners of some shacks that still need to be rebuilt, hammers, nails, wire. Items should be brought to Children of Fire or direct to the non-political group in the camp known as Emang Slovo, a registered Section 21 organisation. (details can be provided). Duncan Brisk aged 13 of Colchester, UK, who collected money to help with groceries and get-back-on-your-feet supplies. Mays Chemists in Melville provided first aid supplies for minor injuries for the people rebuilding their shacks. Investec employees donated clothes.Tokkie's Servicing and Repair Centre in Mondeor provided fruit for the children affected and packets of sweets for many squatter camp children on Christmas Day. Dieter de Meyere of Amamiwa provided 50kg of mielie meal.Anthony brought bed linen and clothes. Makros in Woodmead contributed vouchers that helped with purchases of some food, toothbrushes, etc. Peter & Cherith Munger, Mary & Ernest Hutchinson, Lorraine Doyle, Julia Hill and her parents, John & Lyn Ernstzen, Lisa and Lance Hutchinson, Lynn Densham, Lorna McCrindle, Molapo Tsotsotso, Mieks Boehmer, St Mungo's church, and others whose names may not have been recorded. Bedding was taken by Children of Fire on Christmas Eve to the 16 families in Alexandra also affected by fire. The Alex residents had been given some mielie meal by Region 7. Residents of Joe Slovo (also known as Slovo Park) said that the political committee had received bread but were keeping it in the old crèche and refusing to share it with the people left destitute by the fire. Region 4 said that in addition to some building materials, they had offered food and accommodation to people affected by the fire which was "declined", but in the centre of the camp the residents said that no one had told them anything about this offer. City of Johannesburg housing officials visited the scene at Slovo but Disaster Management was conspicuous by its absence. Godfrey Segudu,the official theoretically in charge of Alex, had his cellphone turned off on each occasion Children of Fire's volunteers tried to contact him. Donations can be taken to 111 St Swithin's Avenue, Auckland Park 2092. For people in Alex they can be taken to the UMashesha office in 4th Street, Wynberg - contact Thomas Ranamane 082 692 2590; Emanuel Mthombeni 072 279 2108. 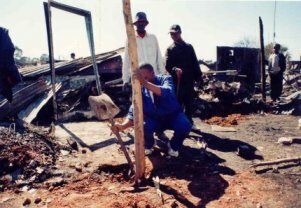 Somewhere around 3am on Monday 22nd December 2003 a fire started at Joe Slovo squatter camp in Coronationville, Johannesburg. The fire was allegedly set by a 24 year old man who had allegedly twice been previously accused of theft. The people said that the fire brigade took a long time to come and that the firefighters were inexperienced as to how to minimise the spread of fire. The sole water tank provided by Children of Fire to the community, was used to good effect at the nearest shacks. The fire was stopped adjacent to the tank. Nonetheless at least 186 families have lost everything. This community was given ten firefighting water tanks in December 2001 but they were chased away at the time by David Masilo and his cohort Thomas. David Masilo works directly for the ward councillor Fadiel Moosa. (Ward 68, Region 4). Telephone calls were made at the time to Marvi Phanyane in the Mayor of Johannesburg's office, begging that they talk sense to the ward councillor but the tanks were turned away. This was recorded on national TV news. The tanks were subsequently given to other communities in Setswetla, Alexandra and to a squatter camp in the Benoni area, where they have been used effectively. 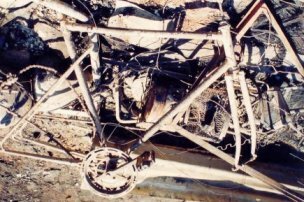 Since the ten tanks were turned away from Joe Slovo, there have been numerous small fires and one terrible fire on August 25th 2003 (see below) in which 2000 people lost everything. A few families affected in August have again lost everything, including the little girl Tsholofelo, one of the children who was taken in by Children of Fire last time around. While the material loss is great again, the only blessing is that a lot of people had already gone home to relatives in rural South Africa for the Christmas period. They will be shocked to return to piles of twisted metal and maybe others rebuilding where once their shacks were. In the centre of the inferno, a couple lay sleeping. Wally Maduna, in his early 50s and Sinah van Schalkwyk aged 52. Just the day before, Wally had been talking to me. His ID was burned in a previous fire and he asked my help to go to Home Affairs in Harrison Street, to get another one. I told him that I would help him immediately after Christmas, as I had a lot of work up til that time. This morning I saw what was left of his body. A kind well-mannered and gentle man was just a lump of blackened flesh. Sinah lay beside him, equally unrecognisable as a once-lively talkative woman. At the source of the fire, Katlego Malatji, a 13 year old boy, was terribly burned. He was taken to Helen Joseph Hospital as allegedly there was no space in Chris Hani Baragwanath burns unit. Anyone who is badly burned in Johannesburg, must go to Bara. It is the only state hospital properly equipped to deal with burns. (WE WILL UPDATE ON KATLEGO'S CONDITION LATER). As the fire is a suspected case of arson, Inspector Lawrence Shikwambana from Brixton SAPS was on the scene. The mortuary van had not arrived five hours after the fire began. People stood and looked at the human remains, their faces as ashen as the surroundings. My son Tristan (12) called 10111 as soon as I had news of the fire and he again called them as I phoned him from the squatter camp, learning the "control four" terminology to ask that the mortuary van get there more quickly. Requests to the fire brigade to surround the area where the bodies lay, with red tape, fell on deaf ears. Joe Slovo squatter camp has some 8000 residents. The population is predominantly Tswana from the Mafikeng area, but has people of all South Africa's linguistic groups and a few from outside South Africa as well. The large fire in August 2003 started at Majepere's shebeen, due to a drunken argument. 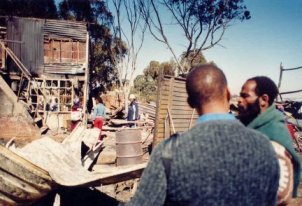 The previous large fire in mid July 2001 also started at Majapere's shebeen. The trigger was alcohol. The second large fire in late July 2001 started at the end of the squatter camp closest to Coronation Secondary School. The trigger was alcohol. Background information is on the website. Residents of Joe Slovo who have been trained through Children of Fire and Brixton Firebrigade in firefighting who assisted this time around included Patrick Ramohai, Busi Nhlapo and Collen Mudau. All three of them lost their homes in this latest fire and were suffering the effects of smoke inhalation. Small saucepans, stoves, candles and safety candle holders, non perishable food, tin openers, buckets, bedding, clothes for fat, thin, old, young. School uniforms, text books, shoes, straight timber poles for the corners of shacks that need to be rebuilt, hammers, nails, pickaxes, wire. They can be delivered to: 111 St Swithin's Avenue, junction Sunbury Avenue, Auckland Park. 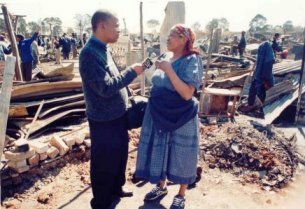 August 2003 On Sunday 24th August 2003 at 9pm, trustee Bronwen Jones was called by the residents to help with the fire at Joe Slovo squatter camp as the fire engines were not yet there - an hour after the fire started. She went immediately and helped until about 1am, getting the hundreds of children to shelter with local residents in Crosby and some into the school hall at Coronation Secondary School. One kind woman took in eight boys including young brothers Vhongani and Khumbulani and other families were persuaded to take in smaller groups of mothers and babies. All the children in need were known to Children of Fire as it has worked in this community for six years. Two of the children Tsolofelo (12) and Alfred (9) went to Auckland Park for several days as well as two little dogs made homeless by the blaze. The children (and the dogs!) went to the Johannesburg School for Blind, Low Vision and Multiple Disability Children (also set up by Children of Fire) until they could be safely returned to their families. The dogs were also vaccinated and dewormed. Sadly, political intimidation led to ten fire fighting tanks donated to the Joe Slovo community by Children of Fire in December 2001, being taken to other squatter camps instead. They would have reduced the damage enormously if they had been in situ. However residents who had been trained in firefighting by Children of Fire, helped break down two rows of shacks in the camp as a fire break. This meant that only one third of the camp was razed to the ground instead of the whole camp. These trainees included Busi Nhlapo, Mlungisi Cakile, Obakeng Maje and Collen Mudau. The hose fixing for the nearest hydrant broke off, delaying the fire brigade's effective response. Some eight fire engines attended the fire eventually, working from two sides of the camp where access was possible. On the Monday morning Children of Fire handed safety candle holders and candles, and bars of soap, to some 180 families. The next day it provided bags of mielie meal and maize rice to 276 families. 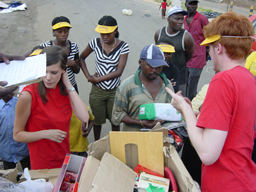 The next day it provided saucepans, tin openers, clothes and shoes to 200 families. The next day tins of beans, tomatoes, packets of oats, and more domestic items were shared out and by the Friday some 60 good blankets, two tons of tinned mackerel and more domestic items were also given to the people. Thank you to Lisa Hutchinson, Rosemary and her father Alf Custers, Investec Cradle Group, Pick n Pay, Debbie, John West, Hollard Insurance employees, AMB Holdings, Operation Snowball, Norman and many more people. The community is in need of school uniforms, exercise books, dictionaries, stationery, more wash things, and every possible item of household furniture that could be taken their way. Two weeks two days before this fire, 108 families in Setswetla, Alexandra, lost everything. Children of Fire is continuing to help them as well. The UMashesha have been active in both communities, especially Dorkus Botopela, Cliff Mokaba, Rossina Malatje, Lucky Magampa, Thomas Ramane, Jimmy Mathye, Emmanuel Mthombeni and Norah Maluleke. Children of Fire assisted the media (SABC radio, 702 and others). The cause of the fire in Joe Slovo was a drunk and angry woman throwing a paraffin stove at her husband in a two storey shack. They lived above Majapere's shebeen. The owner Aron Rambuda is a major squatter camp landlord. His gas cylinders and other people's paraffin stocks made the blaze particularly severe. A large fire also started at his shebeen on July 17th 2001. Elderly residents were taken to hospital for smoke inhalation but there were no major injuries this time around. However some 550 shacks burned down affecting 2000 people. The cause of the fire in Setswetla (at 12 noon on a Friday) was a police raid for illegal immigrants. As the men ran away, the last thing on their minds was to turn off paraffin stoves or to check if they had fallen over. 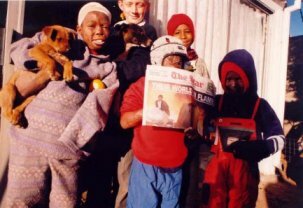 Children of Fire also undertook fire awareness campaigns in Howick, Pietermaritzburg and Port Elizabeth during August 2003. Contact us on firechildren@icon.co.za or 011 726 6529 if you can help. There have been two fires in Setswetla squatter camp at the far end of Alexandra Township in late May and another fire in 1st Avenue Alexandra in early June 2003. The fire in 1st Avenue resulted in a fatality and injuries; the other fires just left several families destitute. 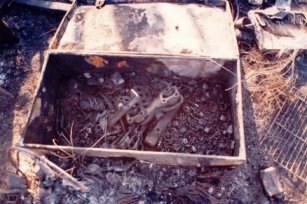 The fires were due to a paraffin stove exploding; illegal electrical connections catching fire; and a knocked-over candle. We need blankets, clothes and food to help these people. Thank you to The Star's Operation Snowball for ten blankets and to St Mungo's Church for donations of clothes. The office email access is currently not available but please phone 011 482 4258 if you can help in any way. A fire occurred in a squatter camp off 11th Avenue in Alexandra at 1am on Sunday 9th February 2003. There were no serious injuries. Close to the London Road end of the avenue, the fire left 96 people destitute. The list of people affected will be placed on the website at the end of the week, due to technical problems. Children of Fire's UMashesha (quick mover) volunteers were quickly on the scene, including Jimmy Mathye who has just qualified as a Basic Ambulance Assistant with St John Ambulance. The UMashesha are pleased to report that this time Region 7 housing has been decisive and the people are being moved temporarily to some empty Reconstruction and Development Project housing on the edge of the Vasco da Gama Road. Disaster Management has provided the people with blankets as well as a little soup and bread - also a marked improvement on their handling of the previous large Alex fire. However the fire should not have been so devastating. No Alex fire engine could respond because there was no engine driver on duty. The station has a severe staff shortage and a shortage of volunteers. The first engine that came from Sandton had no water. The second engine that came from Sandton had no water. Only the third engine carried water. That delay caused many homes to be lost and damage estimated at R360 000. No fire hydrant could be located near to the scene of the fire. And the local fire brigade say that not all the hydrants have water in any case. Children of Fire is appealing for clothes including school uniforms, toys, school exercise books, shoes, crockery, cutlery, non-perishable food, washing powder, soap, toothpaste and toothbrushes, and cooking pots. Cash donations will be used for safe candle holders (R12) or for small sugar-cane-gel stoves (R50) but if we are to purchase stoves we need to buy in bulk and that would require a significant donation. Items can be delivered direct to Thomas Ranamane, head of the UMashesha, at their small office on the edge of Alexandra (Wynberg) tel: 082 391 3698 or to our Auckland Park office tel 011 482 4258 or 011 726 6529. Thank you. The fire started around 3.30pm on Thursday when a woman called Bulelwa Mbona (30) forgot she had left samp (a form of maize meal porridge) cooking on her primus stove and went to play cards. Victor Khumalo, of the Children of Fire UMashesha, was nearby and organised a bucket brigade to tackle the blaze. He said: "The fire brigade came late to the scene. The first engine - their pipe burst. The second engine, there was no water coming from their pipe. Then the third managed to start extinguishing the fire, but really it was too late." Malcolm Midgley of Johannesburg Emergency Services praised the UMasheshas' work, saying: "If they had not acted when they did, hundreds of people would have been left homeless." As it was, 98 people (including 31 children) were left destitute. The woman who began the fire and another woman were taken to the Marlborough transit camp but all the rest had to shelter in old shipping containers that had formerly been used as a clinic on the edge of Setswetla squatter camp. Setswetla is at one end of Alex. The women were to sleep inside and the men were to be given a tent... but no tent ever arrived. The clinic was foul-smelling and dirty before they arrived but no cleaning materials were offered despite one of the temporary residents being a newborn baby girl (born on November 6th, 2002). Thin grey recycled-cloth blankets were provided and, eventually, four 50kg sacks of mielie meal, three 50kg sacks of soup and one 50kg sack of dried beans. A week later only a little soup and maize flour remains with no talk about fresh provisions. The people were given no cooking pots or stoves. In urban Alexandra one cannot easily look for wood for fuel and a pot is essential to cook food in. Children of Fire approached Game Stores' head office in Durban and they allowed us to choose 30 pots from their Wynberg store. Pick n Pay Hypermarket in Norwood also kindly allowed us to take forty Blue Ribbon loaves of bread and their leftover cakes and rolls on Saturday, November 9th, to share among the people. Clothes and other donations were given by the congregation of the Baptiste Kerk in Auckland Park, neighbour Jackie Wrighton, journalist Trish Guy and her friend Joanne Steytler, and one listener to an appeal on Radio 702. More unusually and especially heartwarming, a group of residents of the Joe Slovo squatter camp who have previously been helped by the charity, cleared out their shacks and sent two sacks of clothes to their compatriots in Alexandra. We also handed on 30 little teddies knitted by the UK Diocese of Chelmsford "Teddies for Tragedies" group and brought to South Africa by Tina Robinson as well as toddler clothes brought out by Liz and Shula of Markel International, based in the UK. We thank them all. School uniforms are needed by all the school-age children but particular requests have been made by Jabulile - for a blue high school dress and associated uniform for 13/14 yrs; Andile needs Ekukhanyisweni School - Maroon uniform for 10/11 yrs and Nosisi needs a black tunic, white shirt and other uniform for 7 yrs. The displaced community was angry that their building materials had been removed by Disaster Management with no promise of compensation. They say that the "zincs" - sheets of corrugated iron - can be reused and have a second hand value of some R50 a sheet. They were scared by rumours that they were going to be moved to a distant area called Tembisa. They said that their children went to school in Alexandra and that many of them have piece jobs or family support systems around the township. They were then told that they were going to be moved to seven zozos (like large prefabricated metal shacks) in Marlborough and said that they could not divide the remaining 46 households into seven groups - that it would simply be inappropriate for them to be forced to live in mixed units with relative strangers in very close proximity. Then the police arrived on Tuesday November 12th and demanded to know who gave them permission to live in the clinic! All this time there was no central official caring about their welfare. The people said that even their R11500-a-month ward councillor was not interested in assisting them. Resident Emanuel Thebo said that with all the uncertainty about where they would eventually be allowed to live, all the people who were previously self employed with small shops or hawking businesses, had no chance to start earning an income again. The UMashesha contine to monitor the situation with member Rosinah living very close to the displaced community. On Thursday 14th November, Mrs Ncumisa Mehana of Region 7 Health told Children of Fire that she would try to assist if social services, housing and disaster management were doing nothing. More household items, mens clothes and shoes would be much appreciated by the residents.. as well as the loan of a bakkie to transport a cot from Auckland Park to Alex, for newborn baby Zandile. Please contact 011 482 4258 in Auckland Park or Thomas Ranamane on 082 391 3698 if using our Wynberg office. 1. Martin Sisulu (21 yrs) and his two brothers Siyamthemba and Bongi Nkosi (both 27 yrs). 2. Khauphile Tywalana (34yrs) with Nomthuze Thobeka (32	yrs) and children Lubabalo (5) and Amanda (2). 3. Zolis Magawu (28 yrs) and children Thembalethu (12) and Sakhikhaya (5). 4. Ngabisile Zuziwe (43 yrs). 5. Bigboy Mbone (28 yrs) with children Thabisile (7) and Xolani (18 months). 6. Tabo Moni (30 yrs) and child Siyamtanda (8). 7. Bazi Gcinikhaya (29 yrs). 8. Vuyolwethu Mzalisi (24 yrs). 9. Sam Ntozili (33 yrs) and Nomveliso (23 yrs). 10. Cosmos Nleya (29 yrs). 11. Zoleka Noleleni (24 yrs) and Sanuse Tyaleni (36 yrs). 12. Andile Ncame (36 yrs) and Phindile Zwane (33 yrs). 13. John Masuku (27 yrs), Vuyuswa (32 yrs) and children Magolo (15) and Maphapheni (10). 14. Milford Mhlongo (34 yrs) and Fino (26 yrs). 15. Thabo Maselana (29 yrs) and Thobeka (50 yrs), Bongani (25 yrs) and Svuyile (15). 16. Lulamile Sibuta (32 yrs) and Noncedo (30 yrs). 17. Bongiwe Thinga (28 yrs). 18. Joyce and Vusi Nyathi. 20. Tembisa Phahiwa and daughter Nosisi (6). 23. Sam Khumalo and Bulelwa and children Nonzuze (boy aged 12), Anna (6) and Nosese (girl of 14 months). 25. Sithelwa Qominyana and Sithembisa. 28. Lundi Mzuzu and Nozuko. 29. Ntombi Zanele, Mbalo - child Siyabonga (15). 30. Nomasoma Tinga and children Wando (boy aged 8) Luleka (girl aged 4). 31. Sithembele Fikepi. 32. Ntando Nomjila. 33. Philison Maphadimeng and child Makamele (girl aged 16). 40. Jane Mwale and children Jabulile (girl aged 12), Andile (girl aged 10), Zodwa (girl aged 2), Zandile (girl aged one day) Mathuli (18 years) and her child Nkosiegiphile (1yr). 41. Xoliswa Macklein and children Vuyokazi (girl of 14), Sbabaro (boy of 6). 42. Phatiswa and child Khuna (boy aged 6). 43. Pinki Siqula and baby Mihle (2 months). 45. Phamela Mguli and children Amanda (12), Vuyo (boy age 7), Luxolo (boy age 6). 46. Bulelwa Ruxwana and baby Aneza (one month). 47. Fino Moyo and Nendoda. 48. 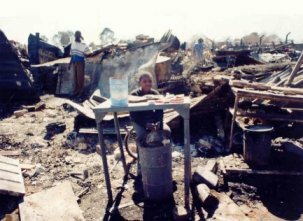 The UMashesha also helped after a small fire in Setswetla on October 14th 2002 where eight shacks were damaged but the nearby Children of Fire water tank sponsored by Rosebank Rotary, was used to douse the flames. It had not been re-filled by November 8th but the UMashesha will keep requesting the fire brigade to do so. 7. Samson Sebola (two children). The total number of people in the combined households was 22. 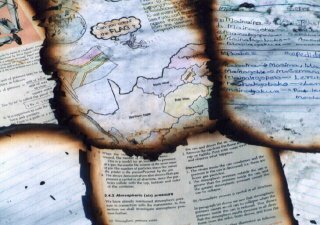 Burned school books are just one of the many casualties when a shack burns down. Children of Fire estimates in 2002 that each shack burned down is a financial loss of at least R11 000. The shacks were squeezed together to make way for construction of the new flats. In September 2002 some 24 families lost everything in a squatter camp fire .. but the flats remain empty. Early in the morning of Thursday September 5th, 2002, a man was preparing for work in the squatter camp on 5th Avenue, Alexandra, near to London Road. He went out, forgetting to turn off his primus stove. When he realised a short while later and returned to turn it off, it was too late. A score of shacks were ablaze. The fire brigade came quickly and doused the flames but most families had no time to rescue any possessions at all. As the children were still on holiday (Gauteng Province state school holidays were rescheduled this year because of the Sustainable Development Summit), they lost their uniforms and their books. 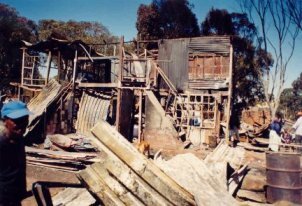 Burned pages of carefully written notes were left among the debris of crumpled corrugated iron sheeting and twisted metal bedsteads. But all the mattresses, blankets, curtains and clothes were gone. Because it was a daytime fire, fortunately no one sustained any serious injuries. Normally people would wait for the metal and ash to cool and resolutely try to start building again - leastways anyone with enough money to buy replacement timber poles, roofing nails and wire. But in Alexandra they are told not to rebuild - because the (theoretical) plan is to rehouse them instead. Just the other side of 5th Avenue are tall, brightly painted, new blocks of flats. The people in the shacks had had to move into a far more dangerous and congested area to make way for the flats construction. But the flats stand empty. Shack residents say that people can only apply to rent the flats if they have a pay slip showing enough regular earnings. Few if any have such formal employment, though one man said angrily that he did earn enough to rent a flat but because he did "piece jobs" such as handyman and gardening work, he did not have a record of his earnings. Children of Fire's UMashesha volunteers said that they would assist him with an application if he, instead of pay slips, had proof in the form of regular savings in a bank or post office. Sometime on Thursday morning, people from Greater Johannesburg Municipality's Region 7 came to visit. They assured the people that they should not rebuild their shacks as they would be rehoused. The UMashesha went and took a careful list of affected residents. Their list was shorter than that taken by Disaster Management because the UMashesha live in Alex and are aware of people jumping on the bandwagon in the hope of a free blanket.. so they interview them carefully. An inaccurate report appeared on a news wire, falsely attributing the fire to stolen electricity but seemed not to be followed up in print. The people on the edges of this settlement had tapped into electrical supplies illegally, but this was not the cause of the fire. As Thursday went on, mostly the people waited to be told what to do. They believed that local government officials would assist them. 22. Sonnyboy his wife and their baby Junior aged three weeks. On Thursday, shortly after 5pm, Children of Fire returned to the scene. People were still waiting in sad groups, not knowing what to do. Every now and then, someone would throw a bucket of water over a new small fire springing up in the ashes. Nine hours after the blaze had been extinguished, the ash was	still hot. A fire engine and a couple of firefighters waited in the road, it seemed more out of sympathy than anything else. The UMashesha asked the firemen to radio their control room and try to get some information for the people	standing there, their faces cold, grey and miserable. Finally three men associated with Disaster Management arrived: two of them were Godfrey Sigudu and Tsepho Motlhale They praised the UMashesha for their assistance with the Setswetla fire a month or so previously and thanked Children of Fire for the large donation of clothes taken there. But the UMashesha were more concerned about what was going to happen to the people from	5th Avenue that Thursday night. Grey blankets made from recycled cloth, were handed out. The thin blankets are normally sold -- in smaller sizes -- to line dog baskets. They leave fluff in African hair and are not very warm, but are standard "disaster relief" fare. There was no food provided. Disaster Management complained at how little stock the Red Cross had. Disaster Management complained that Region 7 Housing had done nothing. Disaster Management told us that the people would be able to sleep in the white church in 3rd Avenue for two days until a better plan was made. So - the UMashesha asked: "You have blankets, you have accommodation arranged, there is nothing else useful that we can do tonight, is there?" "No," they were told. The team then went off for a separate meeting with Zolani at the Alexander Care Centre and arranged to visit the church the next morning to see	what help was needed and could be met by Children of Fire's resources. The people were not there on Friday morning. Contrary to what the charity had been told would happen, the fire victims had been left in the open, all night, to fend for themselves. Children of Fire immediately contacted Vicky Manyati, formerly head of Disaster Management and now a notch higher, as head of Proactive Services. The charity expressed its shock that parents and young children, including a three week old baby, had remained outside all night. We suggested a press conference should be called to explain what a disaster Disaster Management seemed to be. Further calls followed with officials "guaranteeing" that the people would not have another night in the open, nor even another day	of uncertainty. The higher ranking officials were relatively courteous; the lower ranking ones were not. They asked why the charity was questioning what they did. Under what authority? The charity's watchdog role was explained as well as the fact that all bodies funded by the taxpayer - such as Disaster Management and local government housing departments, are answerable to the tax payer. That	the government has pledged accountability and transparency and the UMashesha wanted that to be seen to be put into practice on 5th Avenue. Late on Friday evening one official in the housing department showed great distaste for the squatter camp residents. He said that they shouldn't be	there at all. That there were no places in Alex to erect tents because all the open spaces were filled with shacks. Disaster Management blamed Region 7 housing and Region 7 housing blamed Disaster Management. At 13.40 hours on Friday Godfrey Sigudu said that there was a disaster management plan for all areas of Greater Johannesburg and that one existed for Region 7. "Marike Joubert [the new head of Disaster Management] has a copy". She was not available on her cellphone and did not call back after a message was left. Godfrey said that he spoke to Anthony Blandford, who said that there was no accommodation because the Marlboro transit camp was full with previous fire survivors. Godfrey was told to go to Franz of housing, who comes under Patricia Mazibuko in Region 7. Godfrey said that Franz refused to help. "He said he won't help, he won't do anything." Godfrey said that he had spoken to Franz even on Thursday afternoon. "He was on his way home. I said they can't sleep on the pavement. He suggested the church in 3rd Avenue but the pastor Mr Khumalo was on his way home to Natal. The wife said she could do nothing without his agreement." Godfrey said: "The housing department become aloof. They just stand as spectators. The pastor's wife did agree to the use of the church. We co-ordinated the situation." He spoke of "roleplayers" and "stake holders" and "line functions". But the people slept outside on Thursday night. Late on Friday evening, September 6th 2002, resident Bongani Mngadi said: "We are cleaning here because we didn't get any help from the council. They keep on promising they'll come but they don't. By now we could have rebuilt our shacks and wouldn't be outside in the cold and the rain. They promised a tent for the second night and even that we know is only because Children of Fire kept the pressure on them. But when that council man Franz says it might arrive at 10pm or even midnight, and it only has to come from Mayfair (30 minutes drive away), why should we believe him anymore? There is no place to erect the tent because they told us not to clear our broken shacks away." Another resident commented: "One man said they could put the tent on the road. How? We have no beds. All the rain will run down the road and soak the blankets. The people will become ill. This government doesn't care about the poor at all." Franz maintained that people rejected a tent on Friday night but Thomas Ranamane of UMashesha, who remained on the scene well into the night, said that the people were so cold and miserable that they didn't believe anything any official said any more. Children of Fire only had enough clothes donations to assist the family with the most children as the volunteers had just the week before followed up with all the people in the Marlboro transit camp still hoping to be rehoused after the London Road (near 6th Avenue) fire. 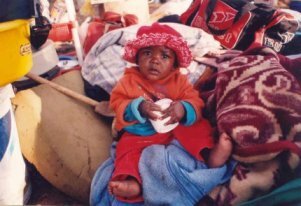 We appeal for more clothes and anything to assist the children in particular. Room 28: Jeaneth Pietiri 8005020898087 (two people). None of the three large fires described below, were even mentioned in local newspapers. More than 180 families losing everything is sadly commonplace for winter in squatter camps. There has been another large fire in Alexandra - the biggest so far this winter. Any assistance will be appreciated. Mathobela Tzani, a Zulu-speaking man aged about 28, went drinking in a local shebeen one Sunday night. One of his neighbours said that people knew he had had too much to drink but none dared comment because of his violent temper when intoxicated. Mathobela was a building contractor with a liquor problem. He went home that night, totally drunk, and fell asleep with the candle still alight, the paraffin stove still on. His shack burned down and he died. This took place in a squatter camp alongside London Road, Alexandra township, near the junction with 6th Avenue (and not far from Inkanyeze Primary School), at 2a.m. on Monday August 5th 2002. In total some ninety families lost almost everything. The adults were each given two blankets by the Red Cross and other organisations helped in a variety of ways. Unlike the other big fires this past winter, the people were not allowed to rebuild their hovels in the previously treacherous path of the powerlines, but are to mostly be rehoused in an area known as Bram Fisher. However in the area adjacent to the 90 shacks that were razed to the ground, far more shacks still string along London Road towards 2nd Avenue. For now a large number of families made destitute by the August 5th fire, remain in zozos (August 19th 2002). These one room corrugated-iron houses with concrete floors and hardboard as rudimentary insulation are courtesy of a Taiwanese Buddhist foundation in Marlboro. The place is clean, unusually quiet and even has a few saplings and token patches of grass, but the people are cold and hungry. Zozos house either four women, four men, or two couples. The men and women share accommodation with strangers or have no accommodation at all. The rectangular zozos are at least twice as big as an average shack and look more spacious as the residents have almost no possessions to put in them. People have beds if the general public have donated them. Hardly anyone has a chair to sit on. They are not allowed to light fires inside their zozos, other than on small paraffin stoves for cooking. Hot water bottles costing about R30 each, would help. Some families have been divided as a mother says her young adult daughter qualified for a tiny house and so took her little siblings with her but left her parents in the zozos. A young man said he had been away the night of the fire and returned to find everything of his was burned - including his security officer's uniform. He lost his job because he had lost his uniform. The Children of Fire UMashesha went to the scene on Monday morning and collected a list of people whose shacks had burned down. They were informed of the fire by team member Joyce. The total number of people living in the shack follows the name of the householder. 1. Paulos Moloimi (4); 2. Christopher Nkukhu (1); 3. Mbongeni Vatsha (2); 4. Nolahlwonga Mosotswa (1); 5. Zwehtswa (4); 6. Sibidi (4); 7. Sibongiseni Melani (3); 8. Zihivieni Sabisa (2); 9. Mngcono Thembohwakhe (2); 10. Happiiness Nogcatsi (1); 11. Zolile Dolo (3); 12. Luvsisile Mgwentisi (3); 13. Siyabonga Nomzaza (4); 14. Lifahakhe Ngubo (3); 15. Leonard Mloi (4); 16. Siyabulela Mtembele (2); 17. Bavuyise Nonzaza (5); 18. Thembelihle Siphitshi (1); 19. Mxolisi Manyala (1); 20. Lunsisani Tshibiyane (1); 21. Christina Khuzwayo (4); 22. Mzimasi Mgweba (2); 23. Thombikayise Mgweba (3); 24. Sibusiso Magobodi (1); 25. Msawenkosi Xubani (3); 26. Jabulile Mkhulisi (3); 27. Solukwane Masilela (2); 28. Jack Lekobale (2); 29. Phatiswa Sofuma (4); 30. Joyce Ndaba (2); 31. Sylvia Nciweni (6); 32. Noma Vokwana (2); 33. Nokuphumla Jekem (2); 34. Simthembile Jekem (2); 35. Sandi Hloongwane (2); 36. Jeanette Pitso (2); 37. Ester Lukhelo (3); 38. Thobeka Mayaba (1); 39. Msukeli Ncamani (2); 40. Andile Mlenze (2); 41. Eric Siwela (2); 42. Xolile Mpetsheni (2); 43. Nelson Hlongwani (3); 44. Costar Sebela (1); 45.Masedi Mogale (2); 46. Solly Rasebotsa (4); 47. Brydget Rasebotsa (1); 48. Thando Ntombi (2); 49. Jonsikhaya Maqhinga (2); 50. Hamilton Madolo (2); 51. Xolisile Mvamba (4); 52. Thembelakhe Somtakakazi (4); 53. Vusani Mshuqwane (2); 54. Samson Mdzimande (3); 55. James Ngobeni (2); 56. Mvelisi Matiwane (1); 57. Mehluli Khumalo (2); 58. Godfrey Malapela (2); 59. Mathuso Keketsi (2); 60. Mawewe Fini (2); 61. Sabatha Mbewu (2); 62. Smytse Sibila (3); 63. Siyabonga Mbasane (1); 64. Sipho Makane (2); 65. Mkuthethwe Qhanqalanna (2); 66 Mbuyiseli Dyido (2); 67. Zamkaya Silingana (2); 68. Bongani Volufo (2); 69. Bulelani Mvamcwa (2); 70. Isaac Sobndula (3); 71. Sylvia Bhiyane (6); 72. Shiebuoy Matlakala (3); 73. Lucky Silima (3); 74. Maxwell Maolo (4); 75. Zamikhaya Martec (3); 76. Mthetheleli Mshushu (2); 77. Khayalethu Masangwana (1); 78. Lunga Siyolo (2); 79. Nomsa Buthelezi (3); 80. Thandi Dube (4); 81. Victoria Ngwenya (4); 82. Makhosandile Wellingtoni Sibobi (3); 83. Michael Mmbadi (3); 84. Richart Maca (2); 85. Nomimizona Mgweba (2); 86. Mkhosi Mathokazi (2); 87. Dumisani Mbokoxa (1); 88. Mathobeka Ndzana deceased with spouse and child; 89. Sonsezo Manyosi (1); 90. Nompumelelo Mehlomakhulu (1). Thank you to: Investec Cradle Group; Michele from AAA; three members of the congregation of St Peter's Anglican Church in Auckland Park; neighbour Jacky Wrighton; the Salvation Army Firlands Children's home; Hans, Lulu and her colleagues at the German School and the late Lydia Manzana, for donations to assist people who lost their homes in the recent Alex fires. 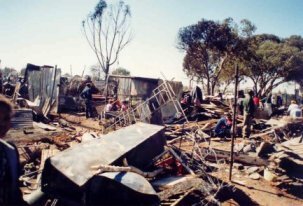 In the Thursday 18th July 2002 afternoon fire, 154 people in 56 shacks in Setswetla squatter camp in Alexandra Township, lost all their possessions. Many people were at piece jobs and so could not drag their household goods away from the inferno's path. Fortunately there were no serious injuries. But in the winter season, the supplies of many charitable organisations had run very low and they need help to build up some emergency stocks again. Children of Fire has placed firefighting water tanks in Setswetla but it is a large camp and the tanks were not in the affected section. The fire was close to the Juseki river and floating pumps could be a future preventative option - if their security from theft and vandalism could be guaranteed. 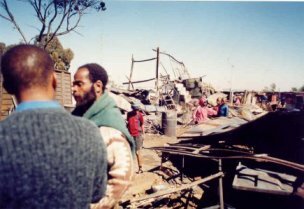 Less than a week earlier, on Saturday July 12th 2002, there was a large fire mid-morning in a squatter camp off 14th Avenue (near the junction with Rooseveldt). At least 22 households lost everything that they own but fortunately there was no loss of life and no significant injury. The UMashesha were on the scene before the blaze was extinguished. The fire brigade could only fight the flames from the rooftops as there was no access possible between the tightly packed shacks. They brought their own water supplies with them. We extended help to the following "family" units: 1. Lucinda Masimini, Nosazizo Faye, Ntombifuthi Masimini, Nosiphiwo Mangwana. 2. Fezile Khwatsha, Nomyalezo Khwatsha. 3. Maria Motimele 4. Mahlongwana Nongena, Nana Nongena (child), Aphiwe Nongena (child), Mambhele Jacisa. 5. Solomon Mati 6. Paul Diale 7. Julius Sibamba 8. Thandazile Ngubo, Philisi Mafu, Vuyokazi Ngubo (child), Simthembile Ngubo (child), Amos Mvemve. 9. Mambhele Jili, Joseph Jawuza. 10. Zuluboy Sithole, Ephraim Lepule. 11. Fundile Mazwane, Noxolo Mazwane Sibhembe, Nozuko Mazwane, Mzuhleli Mazwane, Khaykazi Lubazane. 12. Petros Vilakazi 13. Anton Mabunda 14. John Masango, Thulisile and Nkosinathi (children), Ntomfuh Mqwathi, Elsie Mqwathi. 15. Grace Rallele, Mpho Rallele, Virginia Rallele. 16. Mathe Ntombi 17. Ruben Koos Stoliz, Anna Mokoena, Lovinlie Mokoena. 18. Elliot Ramashaba, Sylvester Mabatha. 19. Bongiwe. 20. Rodrick Nkomo, Andrew Mncube, Sibongile (and baby). 21. Makhosi Cele. 22. Thembi. In recent weeks we have alos helped people at smaller fires in 6th, 8th and 9th Avenues in Alexandra. The UMashesha volunteers now have an office in the Prosperitas Building in 4th Street, Wynberg - just over the highway from Sandton (Grayston Road offramp) and donations can be taken direct to office 212 - just contact Thomas Ranemane on 082 391 3698 or Elizabeth Botopela on 082 396 8029 to ensure that someone will be there - or alternatively to the other office at 111 St Swithin's Avenue, Auckland Park (phone 011 482 4258 or 011 726 6529 to confirm appropriate time to deliver clothing).